I recently purchased a Sekonda branded mechanical alarm wristwatch, made in the USSR in the early 1990s. 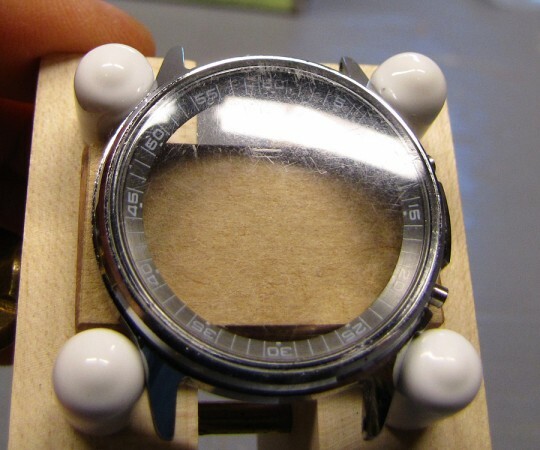 In addition to needing a complete overhaul of the Poljot (Полет) 2612.1 movement (which I cover in my article, Restoring a Mechanical Russian Alarm Watch), the acrylic crystal was badly scratched. Here I describe how I restored it to like-new condition. The acrylic crystal was badly scratched all over. 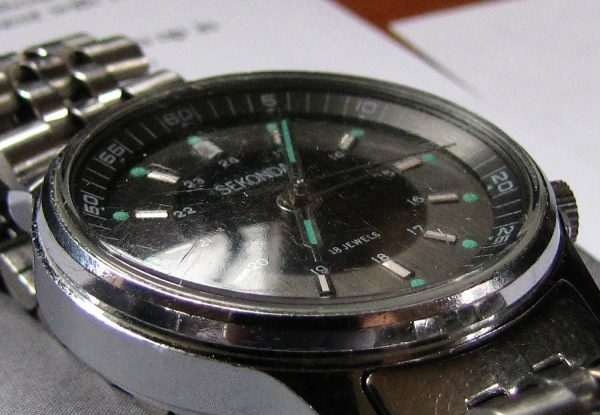 A close-up of the upper half of the watch shows the deep scratches at 12 o'clock, and some more over the "Sekonda" label. To remove scratches in any surface, the surface must be uniformly lowered to the level of the bottom of the deepest scratch. 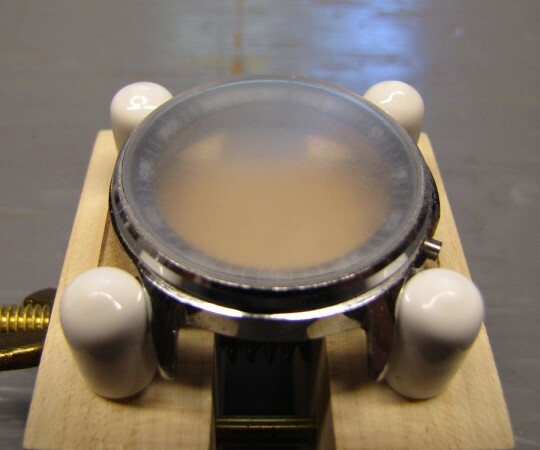 A crystal with only very light scratches is easily polished using watch crystal polish, car headlight polish, or Brasso. Any of these will remove enough material from the crystal to eliminate such scratches. Deeper scratches like the ones in this crystal need a more serious approach. Using a polish would require days of rubbing to remove enough material to eliminate these scratches. Instead, one starts with much coarser abrasives. For this project, I used a set of Micro-Mesh sanding pads, purchased from Lee Valley Tools. A set of Micro-Mesh sanding pads for polishing pens. Photo courtesy of Lee Valley Tools. After removing the movement from the watch, I clamped the case into a case holder. To ensure that I wouldn’t sand the posts of the holder, I put a small block of wood of the appropriate thickness under the watch case. With the movement out for overhaul, the case with crystal was clamped in a case holder. I started with the 1800 Micro-Mesh (approximately 15µm abrasive particle size, equivalent to 600 or P1200 sandpaper), working my way up through the grades to the 12000 (approximately 2µm particle size). Almost done sanding with 1800 Micro-Mesh (15µm). A few scratches are still visible. With the first (coarsest) pad, the idea is to remove all of the existing scratches. In the photo above (and the one below), one scratch is still visible at 9 o’clock, so I went back and redid the 1800 and 2400 steps before proceeding. 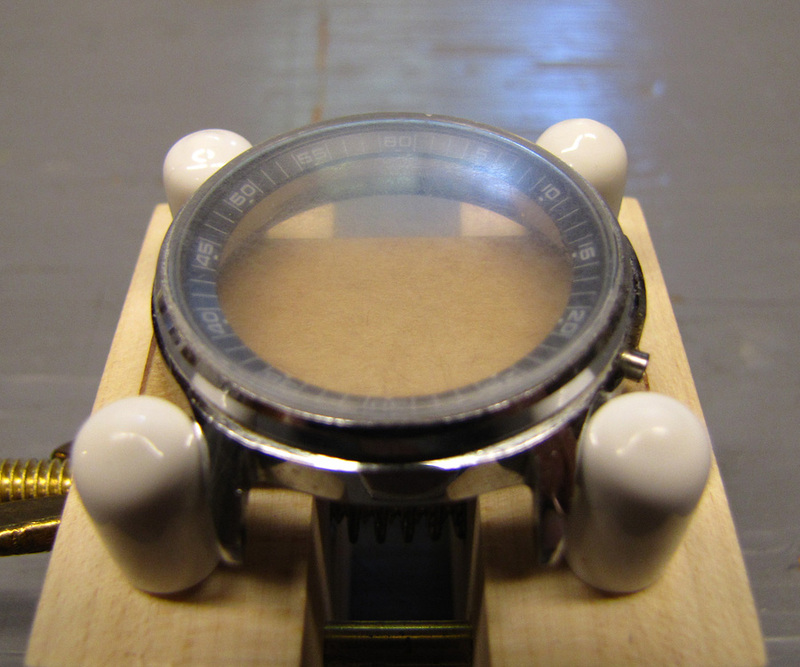 After sanding with 2400 Micro-Mesh (12µm). 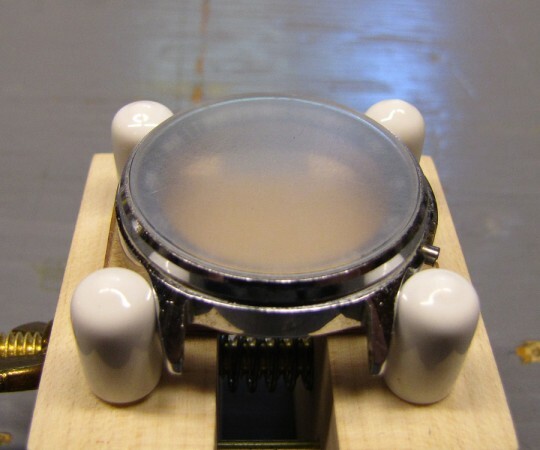 It is important to sand the entire surface of the crystal with each grade of abrasive. 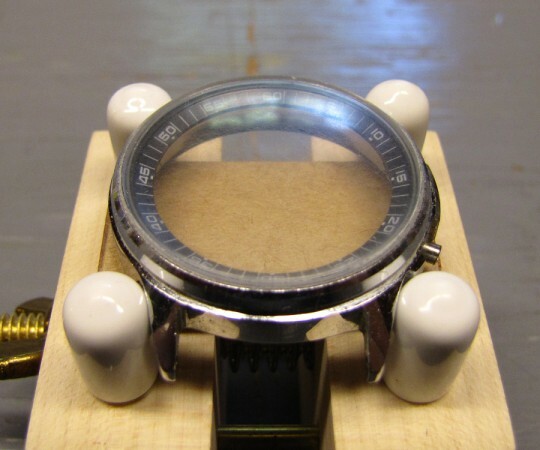 If one were to sand only the initially scratched areas, the crystal would end up with flat or low spots, looking uneven when finished, and giving a distorted view of the watch dial. 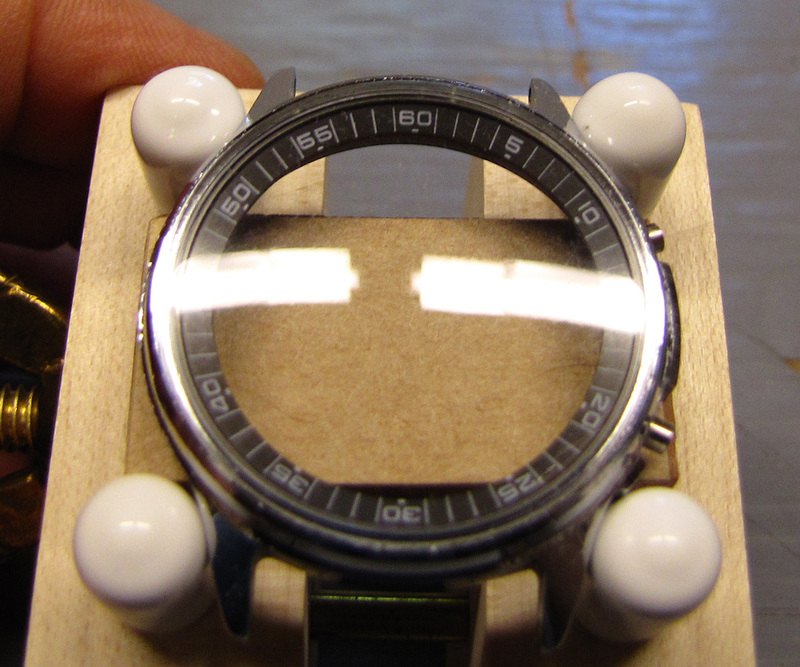 After sanding with 3200 Micro-Mesh (9µm). The goal with each subsequent finer abrasive is to remove all of the scratches left by the previous coarser abrasive. The sequence of photos shows the progress as I worked my way up through each grade of Micro-Mesh pads. It's starting to look much clearer after the 3600 Micro-Mesh (8µm). 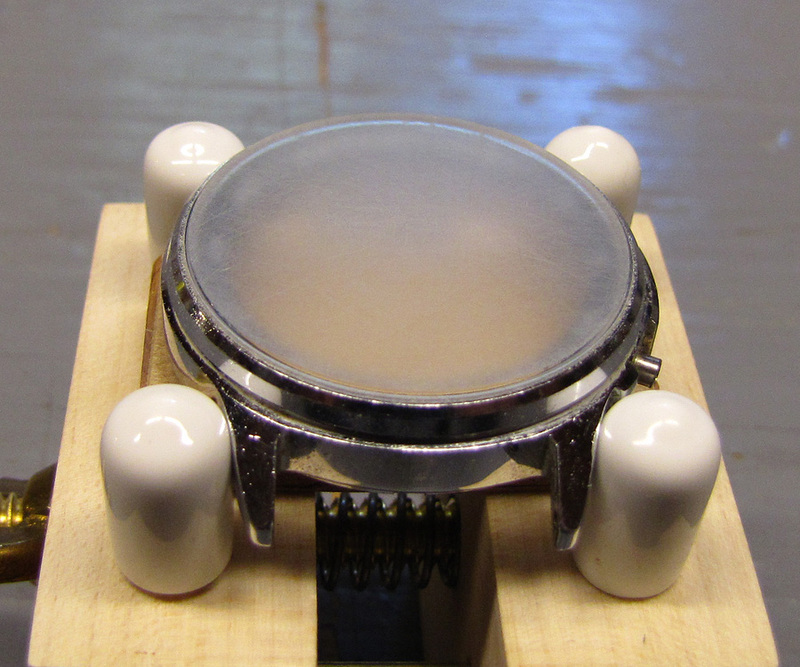 I sanded in small circular motions with each pad, turning the case holder periodically. I continued sanding with a given grade until the crystal was uniformly transparent and would not get any smoother or clearer, and then moved on to the next grade. Another big improvement after the 4000 Micro-Mesh (5µm). After the 6000 Micro-Mesh (4µm), the crystal already looks better than before I started. One thing I discovered is that the pads quickly filled up with acrylic dust, but this was easy to remove by wiping the pad on thick soft fabric (my jeans). This is important, because the abrasive is not very effective if the spaces between the particles are clogged. The 8000 Micro-Mesh (3µm) has made the scratches visible only in close-up photos like this one. Almost done after the 12000 Micro-Mesh (2µm). One could stop after the 12000 Micro-Mesh, as the crystal is already clear, with very fine scratches that can only be seen with a magnifying glass. However, a final polishing with a plastic polish makes it really shine like new. I used Meguiar’s PlastX, intended for polishing car headlights. A final polish with Meguiar's PlastX removes the remaining sanding scratches. The entire process, including taking the pictures for this article, took only 35 minutes. Acrylic crystals scratch far more easily than mineral glass or sapphire crystals, but as illustrated here, they are also far easier to repair if they do become scratched. 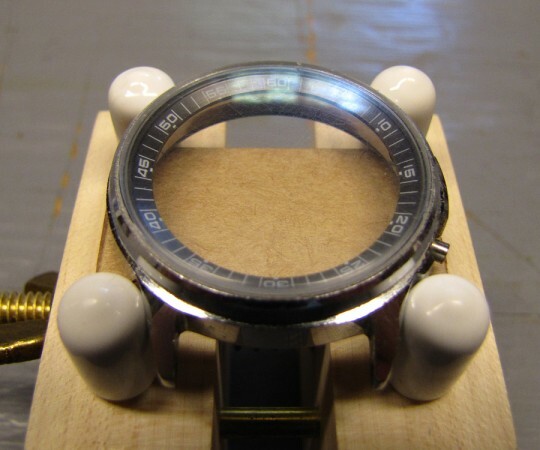 Furthermore, they are much less fragile, making them ideal for watches that experience rough use. I really found your page impressive. The information you provide is really useful and great. This process you indicate are also useful to remove scratches from a damaged CD-ROM. I also must thank to the electronic circuits you provide (The usb charger is a very good project). Thank you so much for your informative article. 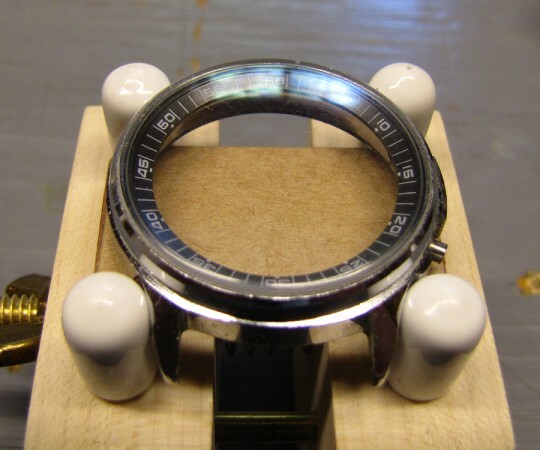 I purchased the same watch, branded as a Poljot, which was in a similar condition. I had a go at repairing the Acrylic crystal as you described, with great success. 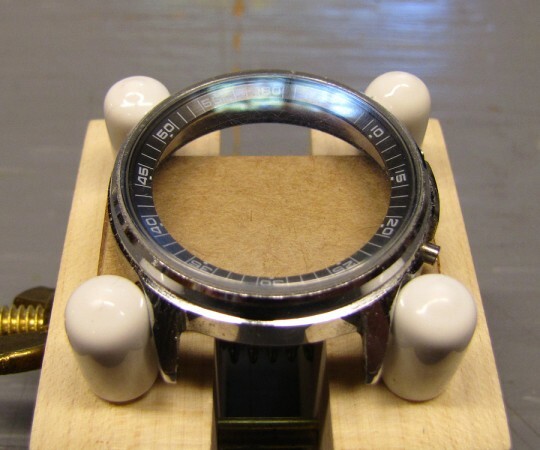 I’m really happy with the watch, it looks great, draws attention, and has quickly become a favourite..